Hardin will always be . . . Hardin. But is he really the deep, thoughtful guy Tessa fell madly in love with despite his angry exterior—or has he been a stranger all along? She wishes she could walk away. It’s just not that easy. Not with the memory of passionate nights spent in his arms. His electric touch. His hungry kisses. It’s no secret that I enjoyed After. I thought it was a great little trashy romance. 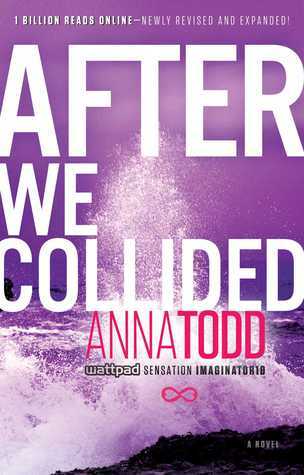 But After We Collided was just more of the same. More fights, more Harlin and Tessa going back and forth, back and forth. It was fine for the first book, but if a book turns into a series, then something needs to happen. I would have liked a little more… well, plot. This just felt so much like After, it was like I was reading it all over again. I think the main problem is that the story is written in a way that hashes out every minute of their day. The timeline never skips ahead. It’s every single day, morning, noon, and night, and by the middle of the book it just felt like… okay, lets skip forward a little now. I don’t need to know that Tessa is curling her hair again. I think while I could appreciate After for being exactly what it was, I just needed more from this one. If I’m going to commit to reading 400 pages, then it needs to expand from the first novel in someway and this just didn’t. Nothing happened. This entry was posted in Book Reviews and tagged 2 stars, anna todd, book review, books, harry styles, life, new adult, one direction, reading, romance, simon schuster, Writing, young adult. Bookmark the permalink.